Posted on March 3, 2017 by Matthew Leib. This entry was posted in Spotlight, Staff Stories and tagged intellectual house, staff story. Bookmark the permalink. When the University of Washington Husky football team victoriously stormed the field at the 1991 Rose Bowl in Pasadena, thousands of dreams were fulfilled. In the same moment, more than 1000 miles away in a garage in Montana, another was born. Basked in the glow of his parents’ television set, reveling in the Huskies’ newly-minted national championship, Iisaaksiichaa Braine made up his mind then and there. Braine declared his intention to his parents, who encouraged him to keep the goal in sight. They knew it wouldn’t be easy, but then again, chasing one’s dream hardly ever is. Seven years later, his father found a job in Eastern Washington and the family decided to pick up roots and move. Two years passed in eastern Washington—what Braine refers to as “some trying times”—but the gamble ultimately paid off. The day he pulled his UW acceptance letter from the mailbox, Braine says he was overwhelmed by a sense of shock and relief. Some 16 years after he first set foot on the Seattle campus, Braine is still there. Today, he serves as the UW tribal liaison and the Office of Minority Affairs & Diversity’s director of wǝɫǝbʔaltxʷ (pronounced “wah-sheb-altuh” and translated as Intellectual House). Built in the tradition of the Coast Salish people who once inhabited the land now occupied by UW, the longhouse-style building provides a space for American Indian and Alaska Native students, faculty, staff and other members of the UW community to gather and share knowledge. “This took 45 years,” Braine says of the efforts to realize the 8400-square-foot building, which opened in 2015 with a goal of preparing American Indian and Alaska Native students for leadership roles in tribal communities as well as on the regional and national level. Inside the 600-person gathering hall, one picks up the faint, yet unmistakable waft of cedar, even as the space approaches its two-year anniversary this March. Intellectual House is one part embassy and one part university—a diplomatic portal for local tribes in their contact with the university as well as a conduit for academic research and business development. 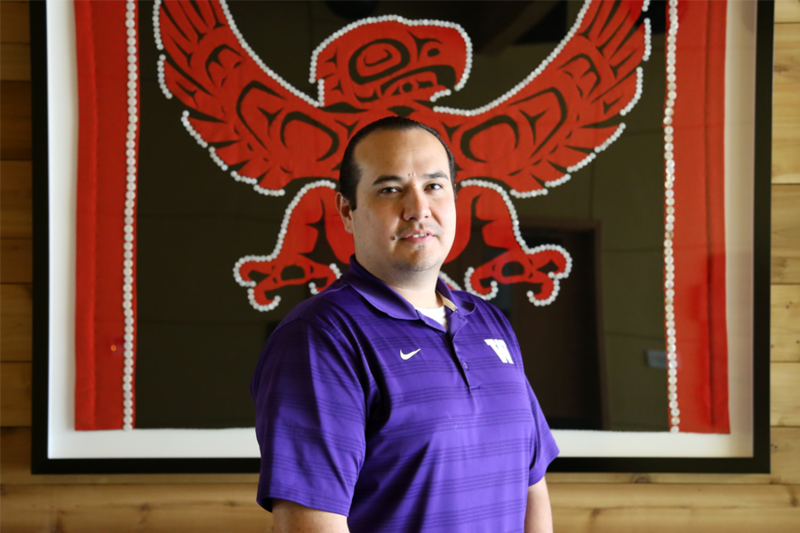 In his role as tribal liaison, Braine works with tribes who work with the University of Washington—whether that entails collaborations for research, business development, or helping University academic units conduct tribally-regulated research in ways that honor indigenous knowledge and promote accountability and transparency through the oversight of tribes’ own institutional review boards. In his capacity as both tribal liaison and director, Braine keeps his eye trained on the whole tribal landscape, surveying it from his multiple perspectives as an educator, advisor, and de facto diplomat, working most often with more than 60 local tribes, but also maintaining an open door to 367 tribes nationwide. For parts of the year, Braine can travel for weeks or multiple weekends at a time, attending conferences and other meetings in order to establish the broadest view possible. If he misses out on an event with a tribe, it’s because he’s focusing on students. Braine lives in three worlds—“the native, the academic, and the Crow”—cautioning that even in his capacity as director of Intellectual House, he has “no rights to any other way” besides that of the Crow. Leveraging that diverse network of expertise, Intellectual House hosts 30 cultural events a year, including basket-weaving class, a healing salves class, gourd dancing, a powwow, a culture coast jam, and traditional cooking (Braine himself abstains from eating salmon because it’s not part of the traditional Crow diet). “The three things we focus on are culture, academic, and professional development,” he says, adding that his goal is for students who pass through Intellectual House to leave with marketable skills, gained in part through professional development events, grant writing classes, resume workshops, business networking nights, and department fairs hosted on site. In this way, the center reinvigorates and reengages itself with each class it graduates—usually around 12 students—guiding them into positions of leadership within the University and broader region. The goal, Braine says, is to prepare students to start teaching and giving back and do so in such a way that also aligns with their professional interests. Braine will often take students along with him to meetings, steeping them in ancient traditions of leading—and learning—by example. Just as he wishes to bring his students into the wider world, Braine says he is always keen on welcoming others into what he calls “our shared space,” citing that it wasn’t only native people who helped bring the structure into being. If Braine understands the hurdles faced by American Indian and Alaskan Native undergraduates, it’s because he’s cleared many of them himself. “It took me almost nine years to finish my undergraduate degree,” Braine says. During spans when he was not enrolled in classes, he stayed on campus, working temporary jobs in UW surplus and doing data entry. He had just quit what he describes as “the worst job I ever had in my life” as manager of a tuxedo shop when the man who would become his mentor reached out to him at the Raven’s Feast Ceremony—the native graduation where Braine had come to see a friend graduate. Braine replied he was looking—and ready—for any sort of work. The man was Julian Argel, a member of the Tsimshian and Haida tribes who served as the UW’s tribal liaison for over 18 years. Under the guidance of Argel (who passed away in 2012), Braine rose from working as an office assistant 1 to become assistant tribal liaison and administrative coordinator before assuming his current roles. Along the way he worked as a counselor with the Office of Minority Affairs & Diversity’s Educational Talent Search, a federally-funded program that provides support services to limited-income and first-generation college-bound students in Skagit, Snohomish and Yakima counties. He also completed his master of science in information management from the Information School in 2015, just in time to take part in Intellectual House’s first graduation ceremony. “They gave me the verbiage to express what I already feel and know,” he says of his experience in the master’s program. Braine confers much of the credit for his academic turnaround on his five-year mentorship under Argel. Argel’s tribal cape now hangs in the entryway of Intellectual House—a visible reminder of the legacy Braine carries forward in working to make all native people more visible throughout the region and to get their voices heard. Braine says it’s key to acknowledge that these are the issues native people face just in getting to college—let alone thriving there. Braine calls himself a “pretty open book,” but there is one thing he wouldn’t mind getting out there. It roughly translates to “good lad” or “good young fella” and was conferred on Braine by his clan uncle because he was always helping his grandmother. Braine has otherwise gone by Ross throughout his life. “People say, ‘that’s too hard to say,’ but they don’t know the implied racism behind it,” says Braine, who is in the process of re-learning the Apsáalooke language, currently only spoken by 22% of Crow tribe members. To learn more about the wǝɫǝbʔaltxʷ – Intellectual House, visit their website. Planning and fundraising is currently underway for a second building that will include student programming space, meeting rooms, an arts lab, and an Elders lounge. Gifts to support the program can be made here.